ISLAMABAD — The Islamist Taliban in northern Afghanistan has captured a strategically important district near the border with Turkmenistan and threatened a provincial capital, killing dozens of Afghan troops in a series of battlefield attacks. During the past three days, the insurgents stepped up battlefield attacks across the country and have overrun territory and killed more than 80 personnel of the Afghan National Defense and Security Force (ANDSF) being trained and advised by the U.S. military. 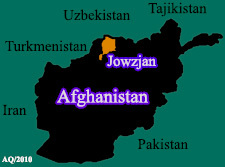 Officials said Monday Taliban fighters stormed Khamyab district in Jowzjan province from multiple directions and captured it overnight. Provincial police chief, General Faqir Mohammad, told VOA government forces withdrew from the area to avoid civilian casualties. The officer declined to discuss casualties among his forces, though reports said the fighting left eight police personnel dead and several others wounded. Clashes were raging in parts of Khamab and telecommunication services remained suspended since the fighting erupted for the control of the key district, according to members of Jowzjan provincial councils. The fighting is taking place about 170 kilometers north of the provincial capital of Sheberghan. Separately, the Taliban’s a so-called “red unit” commando force stormed police outposts in Dashti-e-Archi area in Kunduz province and killed 18 security forces, Afghan officials said. The attack near the provincial capital, also called Kunduz, wounded 24 police personnel. Kunduz has changed hands several times in the past three years and it remains under pressure from the Taliban. Intense fighting was also raging in the nearby Sar-e-Pul province where a multi-pronged Taliban offensive late Sunday captured army and police posts around the provincial capital. Clashes were ongoing in the area and the city, also called Sar-e-Pul, could collapse to the Taliban unless reinforcements arrived in time, warned a provincial government spokesman. The fighting in Sar-e-Pul and Jowzjan has closed the main highway linking the two northern provinces. Insurgents also killed at least 14 Afghan policemen and wounded six others in a raid on police posts in Dara Suf district of northern Samangan province. Taliban spokesman, Zabihullah Mujahid, claimed responsibility for attacks in northern provinces,saying they killed more than 100pro-government forces, though the rebel battlefield details are often inflated. Meanwhile, Afghan and Taliban officials made conflicting claims Monday about who was in control of Dai Mirdad district in the central eastern Maidan Wardak province. The Taliban assaulted the district a day earlier and killed 13 security forces, including the police chief of Dai Mirdad. Provincial council members have confirmed the insurgents entered the district center late Sunday following heavy clashes with government forces. Afghan officials, however, denied reports they have lost Dai Mirdad to the Taliban. The Baghlan-e-Markazi district in another troubled northern Afghan province of Baghlan is also under attack from the Taliban. Officials confirmed on Sunday that ongoing clashes in the areas killed more than 20 Afghan security forces while more than a dozen army and police checkpoints as well as several surrounding villages have fallen to the Taliban. The Taliban has held more Afghan territory than at any time since the 2001 U.S. military invasion of the country. The Afghan government currently “controls or influences” around 56 percent of the country while the rest is controlled or hotly contested by the Taliban, according to American military assessments. While Afghan forces are struggling to combat the Taliban, militants linked to the regional branch of Islamic State, known as Khorasan Province (ISK-P), have also increased attacks, particularly against the country’s minority Hazara Shi’ite community, adding to the problems of the Kabul government. IS-plotted suicide bombings, many of them hitting the capital, Kabul, have killed scores of Afghan civilians in recent weeks.